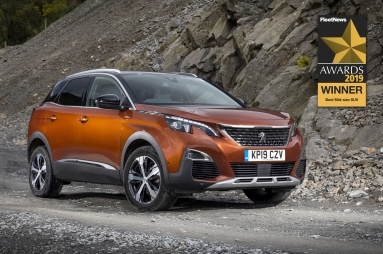 The PEUGEOT 3008 SUV has won the coveted ‘Mid-Size SUV of the Year’ Award at the 2019 Fleet News Awards, beating the BMW X1, Volvo XC40, Kia Sportage, SEAT Ateca and ŠKODA KAROQ to the top spot. The Mid-Size SUV sector is the most fiercely contested in the UK car market with an ever-growing list of competitors, so to be crowned ‘Mid-Size SUV of the Year’ by judges from the fleet and leasing sector, assisted by the leading valuation guides, is a major endorsement. In presenting the award, the judges said: “The 3008 SUV equals happy drivers. Packed with technology, it is great to drive, has stylish looks and a high quality premium interior. This is the car that put PEUGEOT back in the fleet game.” Fleet News noted that since its launch in 2017, the 3008 SUV has proved its worth as a reliable, cost-effective and desirable model. The PEUGEOT 3008 SUV has proved to be a great success, with almost 48,000 sold in the UK. To date, the 3008 SUV has won 65 international awards, including 19 in the UK. The compact SUV features cutting-edge technology including the innovative PEUGEOT i-Cockpit®,12.3” head-up digital instrument display and 8.0” capacitive colour touchscreen with Mirror Screen® functionality, comprising of Android Auto, Apple CarPlay™ and Mirror Link®. The all-new PEUGEOT 508 was also recognised in the 2019 Fleet News awards. The latest model to join the PEUGEOT range was Highly Commended in the ‘Best Upper Medium Car of the Year’ Award. The awards ceremony took place at the prestigious Grosvenor House Hotel in London, hosted by journalist and newsreader Huw Edwards.